The Kaizen methodology encourages ongoing efforts to ensure continuous improvement throughout a facility. This improvement can come in many forms including waste elimination, improved efficiency, safer work environments and much more. To simply say that a facility is employing Kaizen strategies, is essentially meaningless if you don’t have any concrete action items you are following. 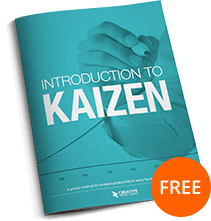 Whether you’re just getting started or you are looking for ways to reinvigorate a Kaizen strategy that is not effective, the following ten tips will be very helpful. Each one can give you ideas on what you can do encourage improvement and allow that improvement to grow and expand long into the future. Nothing in a facility is more important than the overall safety of the employees and the facility itself. 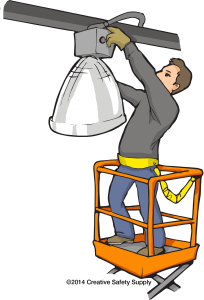 Unfortunately, accidents and other safety hazards are never going to be completely eliminated. That does not mean, however, that you cannot make an effort to dramatically improve the overall safety of your facility. 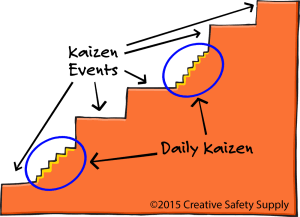 In fact, safety improvement is an essential Kaizen focus because you can realize ongoing improvements with the right effort. Looking at every accident or even near-miss event as an opportunity to learn what went wrong and take steps to prevent it in the future is an excellent strategy. Many facilities first look to place blame on someone or something for an accident, but that is actually counter-productive. Instead, look for the root cause of any issue and see what can be done to fix it. One thing many facilities do when trying to make improvements is select one methodology and use it exclusively. Kaizen continuous improvement, however, can benefit from a variety of other methodologies that are used in most industries. 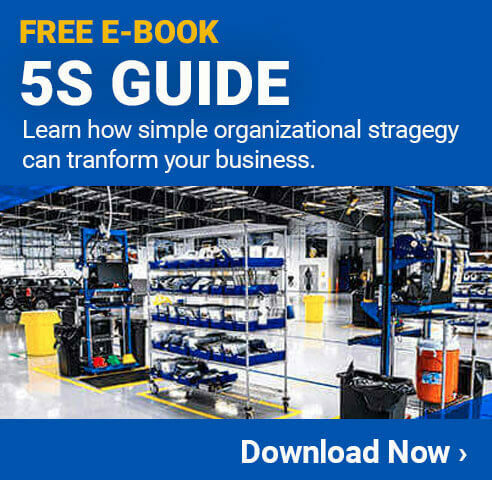 For example, when attempting to eliminate waste you can look to the 5S, Lean or Six Sigma strategies to learn more about how to successfully accomplish this. When looking for safety improvements, consider the 6S strategies and others. The point is, you don’t need to reinvent the wheel every time you are trying to make improvements in a specific area. Look to successful strategies that are already out there and take advantage of them whenever possible. Hoshin Planning is a concept where all employees are looked at as the experts in their specific jobs that they are. Since they are seen as experts, they will be held accountable for achieving the desired successes, including continuous improvement. This is different than empowering employees because it not only gives them the ability to identify changes, but actually puts them in the decision making position. In addition to helping ensure employees are contributing to the continuous successes desired, you are also empowering them with more trust and responsibility. It has been shown that this type of strategy can improve job satisfaction and company results. 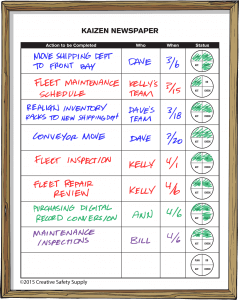 Keeping your value stream and process maps updated and accurate is important. Every time a change is made to an area, for example, make sure you know how it is impacting the value add to that area. This will ensure you are always evaluating an accurate portrayal of your facility so you can make the needed improvements on an ongoing basis. 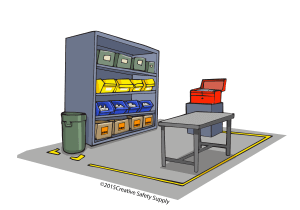 Check out Creative Safety Supply for all of your Kaizen, 5S, and Safety project needs. Why Rethink Business With Kaizen?